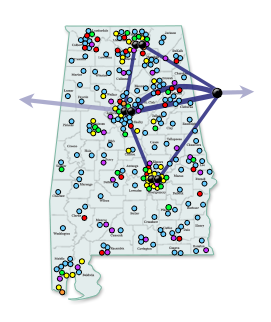 ASA provides colocation service at their data center, Alabama Supercomputer Center (ASC), in Huntsville, Alabama, for all AREN clients subscribing to Managed Internet Access Service. ASC has been designed to deliver a high availability of colocation service primarily due to its use of redundant power, HVAC, and Internet access. Commercial power is backed up with dual generators (one diesel and one natural gas) with each generator capable of running all critical services including colocated equipment. Two sources of conditioned power (A+B) are available with each source incorporating its own redundant UPS system. Colocated client servers can be provided access to multiple Internet sources with no single point of failure.